For whittling wood, we're not at all interested in numbers one or four- #1 requires too much maintainance, #4 while more common on Japanese knives is rare (perhaps even unheard of) on western knives. #3 is easy to see, and what's more its easy to hone or strop. You know when you have the bevel flat on your stone or strop just by looking. Some carvers prefer it, it's the bevel I recommend for beginners. Its the beginning of any grind on a thin material- like Personna blades. Some makes will tell you they use grind #2 in the pic- I have flat ground knives from 12 degrees to 19 and tested the edge. At 15 degrees or less the edge will not hold up- knives with Rockwell in the 50's roll over, Rockwell 60's chip. The edge is simply too weak, it won't even go through basswood. I aim for a 19 degree edge, its long lasting and still easy to push through the wood. Lets do the math- a 19 degree bevel on a 3/8" wide blade calls for the blade to be 1/8" thick, half inch wide blade would be over 5/32 thick. Nobody's giving you an eighth inch thick knife. 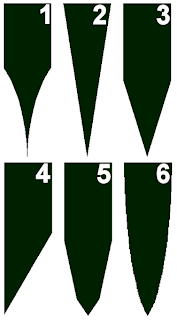 In general, blades that appear to be flat ground have a secondary bevel, more like #5 or #6 in the pic. The secondary bevel can be so small that it's difficult to detect- the bevel can be applied with only the strop (microbevel). There's nothing wrong with that- in my opinion its a superior blade, sturdy and low in friction. It's actually my fav, and the bevel I use on most of my knives. Hollow grind — a knife blade which has been ground to create a characteristic concave, beveled cutting edge along. This is characteristic of straight razors, used for shaving, and yields a very sharp but weak edge which requires stropping for maintenance. Sabre grind — Similar to a flat grind blade except that the bevel starts at about the middle of the blade, not the spine. Also named "Scandinavian Grind", it produces a more lasting edge at the expense of some cutting ability and is typical of kitchen knives. Also sometimes referred to as a "V Grind", made with strength in mind and found on tactical and military knives. The Finnish puukko is an example of a scandinavian ground knife. Chisel grind — As on a chisel, only one side is ground (often at an edge angle of about 20 – 30°); the other remains flat. As many Japanese culinary knives tend to be chisel ground they are often sharper than a typical double bevelled Western culinary knife. (A chisel grind has only a single edge angle. If a sabre grind blade has the same edge angle as a chisel grind, it still has two edges and thus has twice the included angle.) Knives which are chisel ground come in left and right-handed varieties, depending upon which side is ground. Japanese knives feature subtle variations on the chisel grind: firstly, the back side of the blade is often concave, to reduce drag and adhesion so the food separates more cleanly; this feature is known as urasuki. Secondly, the kanisaki deba, used for cutting crab and other shellfish, has the grind on the opposite side (left side angled for right-handed use), so that the meat is not cut when chopping the shell. Double bevel or compound bevel — A back bevel, similar to a sabre or flat grind, is put on the blade behind the edge bevel (the bevel which is the foremost cutting surface). This back bevel keeps the section of blade behind the edge thinner which improves cutting ability. Being less acute at the edge than a single bevel, sharpness is sacrificed for resilience: such a grind is much less prone to chipping or rolling than a single bevel blade. In practice, double bevels are common in a variety of edge angles and back bevel angles, and Western kitchen knives generally have a double bevel, with an edge angle of 14-16° (included angle of 28-32°) and a maximum of 40° as specified by International standard ISO 8442.1 ( knives for the preparation of food).